Overview: The local burger joint and all the fun associated with it is now at your fingertips, thanks to Win A Day Casino and its penny slots initiative - Sam's Burger. Lucky players are in for fantastic payouts and great slots, along with the entertaining experience that comes with them. The reels in this slot game are loaded with all the icons related to one of the most wonderful burger joints, including ice cream, fries, popcorn, coffee, cold drinks and the hefty burger. 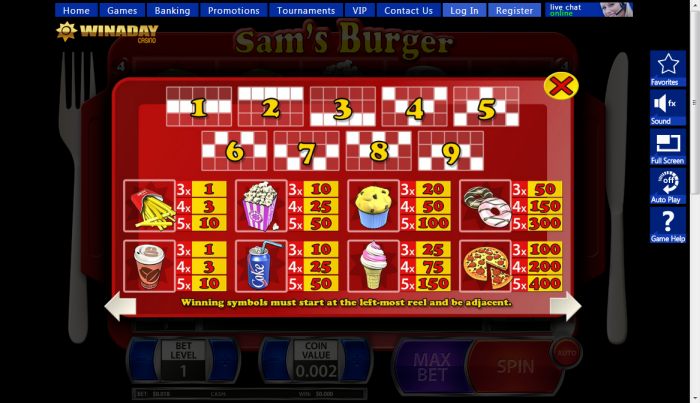 Sam's Burger slot game is presented against the backdrop of a flashy red tray used in fast food joints, with forks and knives neatly placed on the sides to deliver an authentic feel and look. The 9-payline, 5-reel slot game was introduced to players in March 2013. It offers players with an opportunity to play as much as they want for free, so that they can gain experience through practice, before entering the real money gaming opportunities. 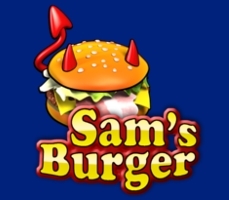 Similar Slots: If you like Sam's Burger, you might like these other slot machines from Win A Day Casino: Birthday Bash, Haunted, Jackpot Jinni, Pyramid Plunder, Safari Park, Touchdown.